Great For Wedding Ceremony, Wedding Table Ornament,Bridal Shower Party,Home Garden Decoration,Hanging Decor, or little animals toys ect. Use these decorative balls in a clear vase with lights for a unique centerpiece. The rustic color makes adding them to any home decor easy. Add a jute string and hang these from your Christmas tree for a natural look. You could glue these rustic rattan balls to a wreath for a touch of the outdoor look. The possibilities are endless! 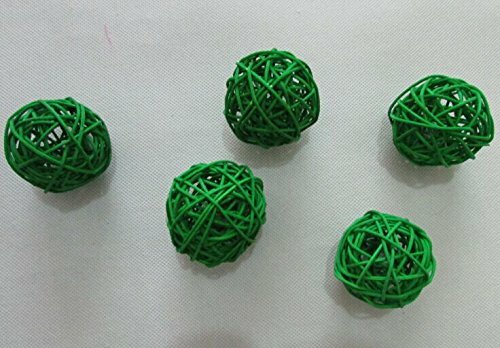 However you use these decorative balls they are sure to be a unique and conversation starting piece. They will be able to be used for many years and seasons to come. Made of natural Rattan. Size:Dia.about 3cm. Package including:4 pcs Dia 4" wicker rattan balls. If you have any questions about this product by USFEEL, contact us by completing and submitting the form below. If you are looking for a specif part number, please include it with your message.